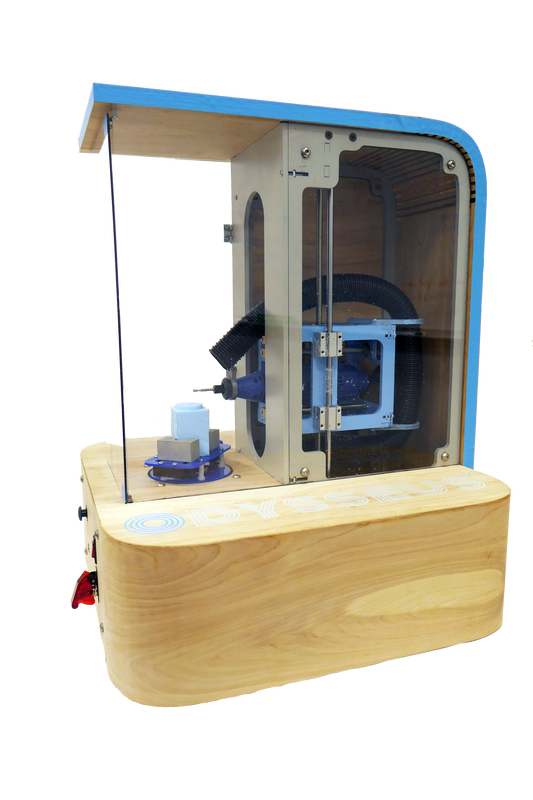 From the beginning, our vision for Odysseus was to have a fully functioning three axis CNC machine. To realize this goal, we had to validate our hypotheses in their most basic forms. We chose to focus on two of the three axis, assuming that adding height would be similar in concept to the horizontal dimension. We also validated our idea of using stepper motors to actuate our system. 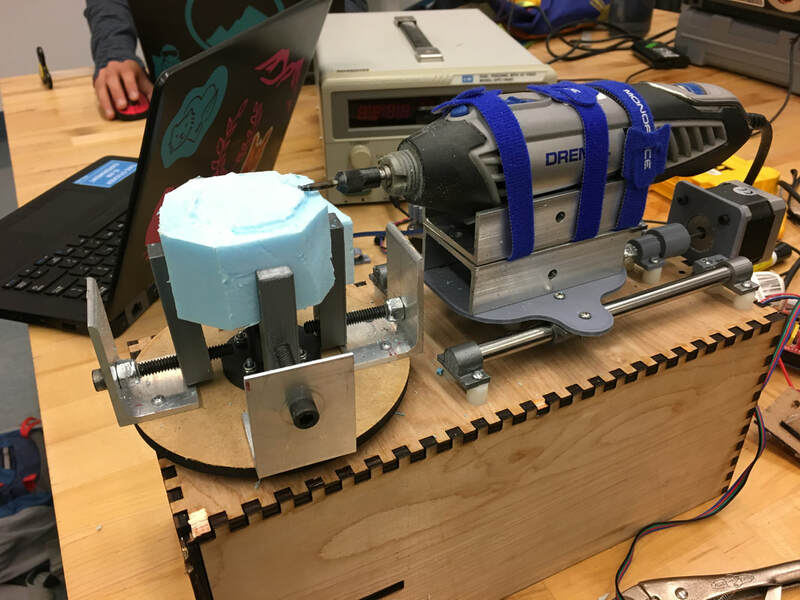 Our proof-of-concept testing was successful, and we were able to machine a circle. Mechanically, Sprint Two had two main focuses: adding the third axis (height) and redesigning the chuck. For this sprint, we decided not to worry about aesthetics, but we did decide to move towards more final mounting positions. By the end of Sprint 2, we had a working machine that was able to move the cutting bit in all three axes. Electrically, we moved towards integration of the third stepper motor and implementing safety features like the e-stop and door switch. We also made software that could machine three-dimensional shapes like a cylinder and a cone. Sprint Two confirmed that our systems would work, and that we were ready to move towards our final product. We made some adjustments to our horizontal slide and chuck, and designed a housing that is aesthetically pleasing and robust. We decided that manufacturing the final housing was outside the scope for sprint three, and instead we focused on getting the structures that actually hold the components in place manufactured and assembled. For the electrical system, we finalized the functionality we wanted (running the stepper motors, cooling, emergency stops, door switches, and joystick compatibility). To us, a final product is something that is aesthetically pleasing, functional, and reliable. This meant we had to finish the housing, finalize all the mechanical sub-systems, and fully integrate the electrical system into the housing during the final sprint. To accomplish our goals, we worked extensively on integration over the course of the final sprint. This involved immense communication between the mechanical, electrical, and software teams to ensure everything would be properly integrated. By the end of the final sprint we had integrated the housing, chuck, and horizontal slide into one assembly, and integrated the electrical system along with it. By the end of the final sprint, we had all teams working together, and we ended up with what we had envisioned: a beautiful CNC machine that works every time.